Yesterday Apple rolled out iOS 8.0.1 only to advise users to downgrade hours later after a flood of complaints and reports of problems left users with a lack of functionality on several important usability factors. A lot of you may have already experienced this, so we have also listed details on how to fix your iPhone. This news has come straight off the back of bendy iPhone 6 Plus phones. The iOS 8.0.1 update which rolled out yesterday and is sure to make a mark in the history of updates, for all the wrong reasons. After users installed the update many users found that signal, data services and Touch ID had stopped working on their phones just minutes after the release. Within hours, and with many more complaints Apple had to hold their hands up and instruct those that installed the update to then downgrade. To restore a phone to a previous version of the software, as an alternative to waiting for Apple’s next update, follow these steps, taken from Apple’s support pages. – Make sure that you’re using the latest version of iTunes. – Connect your iPhone to iTunes, using the Lightning cable. – Back up your iPhone in iTunes on your Mac or PC. iCloud backups won’t restore to earlier versions, including iOS 8.0. – Download the relevant files for the device that is affected – the iPhone 6 or the iPhone 6 Plus. – Select the file by either pressing the Option key and click Check for Update, if using a Mac, or the Shift key and click Check for Update on a PC. – Press Update to install iOS 8 on your iPhone. – The Health app won’t work in iOS 8 after these steps. It will be fixed in Apple’s upcoming iOS 8.0.2 software update. – People who have only downloaded the update but not installed it yet, there is a way to delete it from the device. – Go to Settings, General, Usage and Manage Storage. – Tap Delete Update, and tap Delete Update again to confirm. 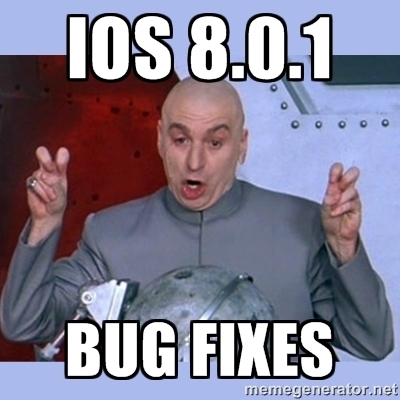 #iOS 8.0.1 Patch Notes: – Fixes a bug that allows you to make and receive phone calls.